Crushpad is a custom winery for small-scale labels that was founded by current CEO Michael Brill in 2004. Crushpad was founded by current CEO, Michael Brill. The opportunity to assist in the crafting of small lots of wine (50 to 2,500 cases) has attracted many wine enthusiasts and more than 5,000 wines have been produced at Crushpad (1 out of every 100 wines sold in the United States). Crushpad is the only wine services company that provides a complete solution for winemaking, compliance, fulfillment, design, marketing and e-commerce with a simple, all-inclusive pricing model. Crushpad moved to the Silverado Trail Wine Studios in Napa Valley over a year ago, but has recently moved again to downtown Sonoma. Bill Foley, owner of Sebastiani Vineyards in Sonoma, has made a major investment in Crushpad, allowing Crushpad to move its primary winemaking facility to a dedicated portion of the historic Sebastiani Winery located a few blocks from Sonoma Plaza at 389 4th Street East. The latest move will allow Crushpad to significantly expand and improve its winemaking capabilities and allow larger groups to partner and collaborate on the production of custom-made barrels of wine using the online social winemaking platform on www.CrushpadWine.com. In addition, a tasting bar will be opened later this year at this new location, allowing more than 100 Crushpad clients the opportunity to offer their wines for sale to Sonoma visitors. The tasting bar will incorporate interactive wine education stations and automated wine dispensers. The new facility will also offer wine blending and sensory analysis classes. Crushpad is able to access fruit from well-regarded vineyards throughout California and Oregon. 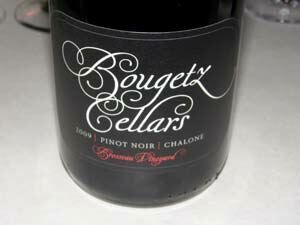 Notable Pinot Noir vineyards include Brousseau (Chalone), Doctor’s (Santa Lucia Highlands), Hayley (Annahala - Anderson Valley), Londer (Anderson Valley), Rita’s Crown (Sta. Rita Hills) and Split Rock (Sonoma Coast). The full list of vineyards is listed at www.CrushpadWine.com/vineyardlist. I recently visited Crushpad at Sebastiani Vineyards in Sonoma and tasted a number of Crushpad-produced Pinot Noirs with current winemaker Adam Smith who joined Crushpad for the 2010 vintage. His background includes winemaking stints at Craggy Range in New Zealand and Bethel Heights, Domaine Serene and Shea Wine Cellars in Oregon. Smith focuses on working with clients who are making Pinot Noir, Chardonnay and Syrah. Kian Tavakoli (formerly Clos du Val and Opus One) is the Chief Winemaker at Crushpad. Smith’s biggest challenges initially were putting faces to the wines and crafting a wide range of wine styles based on client preferences. 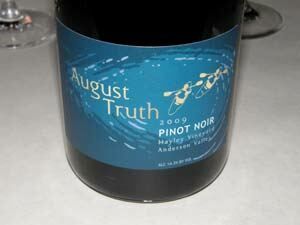 For instance, 250 different Pinot Noirs were produced in 2009 at Crushpad, a vintage that Smith finished. His current stated goal is to work very closely with clients through constant feedback, a goal that was more achievable in the 2010 vintage as he became familiar with the program. I sampled nine 2009 vintage Pinot Noirs and 2 2010 vintage barrel samples. My general impression was that there was good diversity among the wines, the wines were technically sound, but they were of average quality with some modest standouts among the 2009 Pinot Noirs. Retail pricing of the wines is determined by the clients, ranging from $34-$55. I felt the wines priced above $40 did not offer a level of quality commensurate with the asking price. 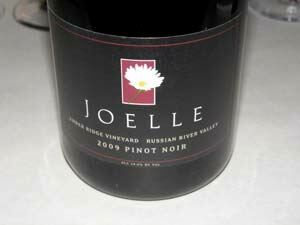 In today’s economy and prevailing Pinot Noir wine marketplace, a Pinot Noir priced above $40 must really delivery an exceptional drinking experience and often an established producer or brand name is required as well. That said, with Smith at the helm and a new modern winemaking facility at his disposable, the wines will only get better. The 2010 barrel samples showed exceptional promise. 85% Pommard, 15% 115. Native fermentation, 25 day maceration. · Moderately deep reddish-purple color in the glass. Fruity nose displaying aromas of plums and raspberries. A softly textured, full-bodied wine that has a dense core of ripe fruit but currently lacks nuance. Should take on more personality after it is bottled. Clones 777 and 667. 40% whole cluster, native fermentation. · A striking wine with a lovely mix of spiced red and black fruits that make a statement upon entry and hold forth strongly to the long finish. Impeccably balanced with charm to spare. Only sexual analogies can do this wine justice. 14.1% alc., $39. Crafted under the direction of Brian Emmett. · Moderate reddish-purple color in the glass. Plenty of ripe fruit in this wine but little nuance. Flavors of red plums and raspberries with hints of savory herbs, offering generous oak, soft tannins and a short, slightly hot, finish. Decent. 14.2% alc., $39. Crafted under thedirection of Tom Bougetz. · First bottle corked. Second bottle reviewed. Moderately deep reddish-purple robe in the glass. Appealing aromas of well-spiced black berries. Generous core of perfectly ripe, sweet, and earth-kissed black cherries and black raspberries lingering on the fruit-driven, slightly hot, finish. Good. 14.3% alc., $39. Crafted under the direction of Jon Tarabini. · Moderately light reddish-purple color in the glass. Pleasant perfume of strawberries, spice and red hard candy. A fruity, somewhat simple wine with a core of red berries and red cherries. Soft in the mouth with bright acidity, restrained tannins and a hint of alcoholic heat on the finish. Good. 14.0% alc., $39. Crafted under the direction of Chris Winslow. · Moderately light reddish-purple hue in the glass. Bright scent of crushed red berries with a touch of forest floor and barnyard. Soft and appealing on the palate with a delicious core of mixed Pinot fruits, supple tannins, and a pleasing hint of oak on the generous and persistent finish. Very good. 14.3% alc., $48. Crafted under the direction of Randy Bennett. · Moderately deep reddish-purple color in the glass. Charming nose showing off plenty of red fruit, especially Bing cherries. Nicely composed and medium weighted with classy dark red fruit, balanced ripe tannins, and a slightly shallow finish. Good (+). 14.6% alc., $54. Crafted under the direction of Dave Ball. · Moderately deep garnet color in the glass. The nose is aromatically shy with only faint whiffs of dark fruit and oak. Moderately intense flavors of sweet black raspberries and plum reduction sauce with gentle oak, supple tannins and a dry, slightly warm, finish. Decent. 14.2% alc., $55. Crafted under the direction of Jean-Marie Truchard. · Moderate reddish-purple color in the glass. A floral nose with notes of savory herbs and subtle oak. Light in weight with soft tannins. Pleasing flavors of dark red berries and spice with some persistence on the fruity finish. Good. 14.3% alc., $38. Crafted under the direction of Tom Harlan. · Moderately deep ruby color in the glass. Lovely aromas of black cherry pie and baking spices. Soft and velvety on the palate, expanding in the mouth with generous and hi-tone flavors of black cherries, finishing with a kiss of oak. Good (+).